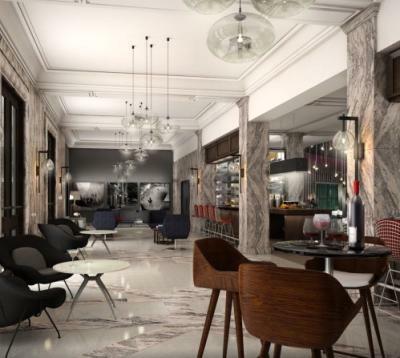 Le Meridien Tampa, Tampa Bay&apos;s newest luxury hotel has been honored by Historic Hotels of America. The hotel opened this year in the extensively renovated 1905 federal courthouse in downtown Tampa. The courthouse, which sat empty for years, is on National Register for Historic Places. Today&apos;s what had been an abandoned building has a new life as an upscale hotel with meeting and banquet space and the French-inspired Bizou Brasserie restaurant. The Bizou&apos;s space retains much of the original architecture of the courthouse, from the coffered-wood ceiling to the marble floors. A plaque notes that John F. Kennedy spoke on the steps of the courthouse when he ran for president in 1960. Historic Hotels of America is the official program of the National Trust for Historic Preservation® that celebrates the finest historic hotels. This year 23 other hotels joined Le Meridien on the list of honorees. To be considered for membership, a hotel must be at least 50 years old; have been designated as a National Historic Landmark or listed in or eligible for listing in the National Register of Historic Places; and be recognized as having historic significance. Opened in June 2014, Le Méridien Tampa, 601 N. Florida Ave., has quickly become a downtown hotspot for out-of-town guests and locals alike, who appreciate the not only its historic destination, but the hotel’s attention to arts, culture and cuisine. The 130-room hotel has already been recognized as the top-ranked North American Starwood Le Méridien hotel for guest satisfaction.